On 25 October 1991 it was reported in Science that Rockefeller University had received a further $20 million from David Rockefeller, who said the gift reflected his "absolute confidence" in Dr. David Baltimore, the university president. Oh what money can buy. 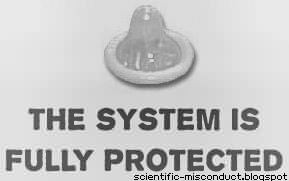 The Baltimore affair was a turning point in the muddling of rules of conduct of science, legal obfuscation of standards, and the acceptance of scientific bullying as part of the game. I am sure it will occupy much space on these pages. On 25 October 1991 Science reported on the ongoing tribulations of Robert Gallo. It would appear that Gallo's frozen samples yielded no trace of any relevant virus. Hard to know what actually happened when such money and power are involved. According to some a massive whitewash. According to others such as Bernadine Healy - who was in the hotseat at the NIH at the time - just an unfortunate collection of easy-to-airbrush minor mistakes. Bernadine of the "minor mistake" school of thought is of course the previous NIH director who appears to dislike actual evidence. She wrote an attack on Evidence Based Medicine accusing it of being "an attack on physicians" and there to support a "microfascist" ideological agenda. For that she was roundly criticized (see here). Her views are telling. Ditto the Baltimore affair above - Bernadine was involved with that too. On 25 October 2003 a blistering editorial in the Lancet took AstraZeneca to task for an "unprincipled campaign" surrounding the marketing of its newly approved statin, rosuvastatin (Crestor). "AstraZeneca's tactics" ... "raise disturbing questions about how drugs enter clinical practice and what measures exist to protect patients from inadequately investigated medicines". "With no hard clinical end point trials yet completed, reliance was exclusively on various surrogate end points"
"the company" has chosen to market rosuvastatin by "applying adventurous statistics to an overinterpreted syllogism". "Rosuvastatin is an extensively studied and well-tolerated drug with a safety profile comparable to other marketed statins combined with a greater ability to get patients to their cholesterol goals than any other single product". That evidence underlying the use of other drugs is even worse. "Lipitor went to 53% of the market without a single long-term clinical trial. How can you say this to AstraZeneca when its competitors have done exactly what it's now doing?" High quality thinking and scientific debate all round. The clinical pearl of the day : use a new drug while it is still effective. Source: The statin wars: why AstraZeneca must retreat. Lancet. 2003 Oct 25;362:1341. On 25 October 2005 a scientist Fardin Oliaei at the Minnesota Pollution Control Agency testified that she had been reprimanded for studying a chemical once manufactured by 3M. Furthermore her bosses had blocked her work. 3M had stopped making the chemical after previous studies had shown that it was accumulating in water and human tissues. Oliaei began looking again in 2002 when 3M said they found further contamination. "At every turn, this MPCA management has tried to hinder my work in investigating the PFC problem," Oliaei said. "The managers became totally blind of their professional obligation." Commissioner Corrigan of the MPCA was quoted as saying: "the MPCA is not a place for scientists. It is not a research institution". And I should look for another job." Oliaei was then disciplined for talking to Minnesota Public Radio. "It's clearly retaliation to me," said Senator Marty. "She's been doing work that a company doesn't like, certain senior managers don't like, and they're treating her like dirt." High science in Minnesota. So Minnesotans, next time you find a crack in a bridge you know what to do. Spenning Cerstor instead of Crestor one heading. Else great.